If you’re okay with the ridiculous fees and exchange rates that Western Union charges then go ahead. I didn’t mention a service like Western Union because I didn’t find it wise spending money on double exchange and transfer fees to load a bank account in another continent. Most people use a bank like N26, Monzo or Charles Schwab to save money on fees over traditional banks. I don’t see the point in having such an account if it’ll cost you more in fees to fund it than you’ll save in using it. Perhaps you need the account for another reason that I’m not aware of and/or the fees are not important to you. Based on your situation, it would make more sense to just use cash everywhere or open a local bank account in Mexico. For example, Scotiabank Mexico has no fees when withdrawing on the Global ATM Network. Forget TransferWise. Xoom has much better rates for international xfers. Used them a few times from US to EU transfers and their rates are MUCH better than TransferWise. 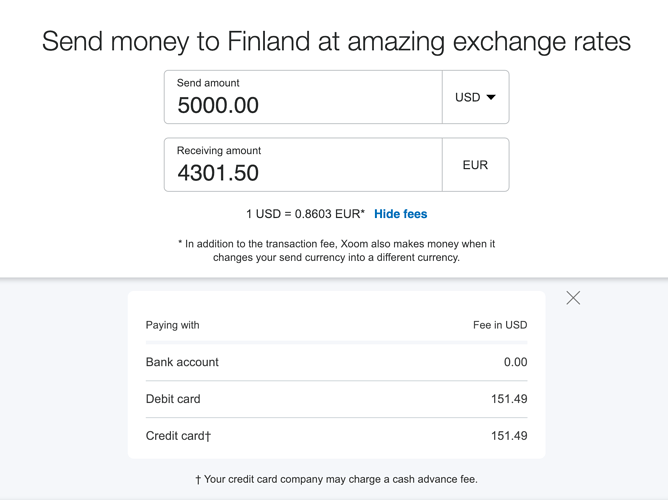 I’ve never seen Xoom being cheaper than Transferwise, even on the USD to EUR corridor where Transferwise is a bit less cheap than when sending European currencies. The difference is even larger if you do a bank transfer/ACH instead of debit card. @elpea could it be that you forgot to take the transaction costs of Xoom into account when comparing the services? Nope. I already have a bank account in the country I am xferring to and so I am depositing in local currency. Bank account to bank account transactions incur 0 transaction fee on Xoom. I checked TransferWise before and that is the reason I use Xoom. Maybe if you don’t have a local bank account TransferWise is better, but for me it just isn’t. 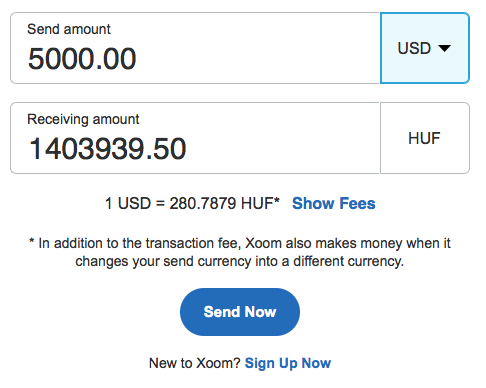 Example, transferring $5,000 US is $46 bucks cheaper with Xoom - based on today’s exchange rates. Has anyone tried Denizen? I downloaded the app in Sept of 2017 and have been a Beta tester and exclusive user since. They use XE’s previous day end rate for FX rate when I convert USD to Euro, have no Bank owned ATM fee’s, and free transfers between my US, Spanish and German linked accounts. 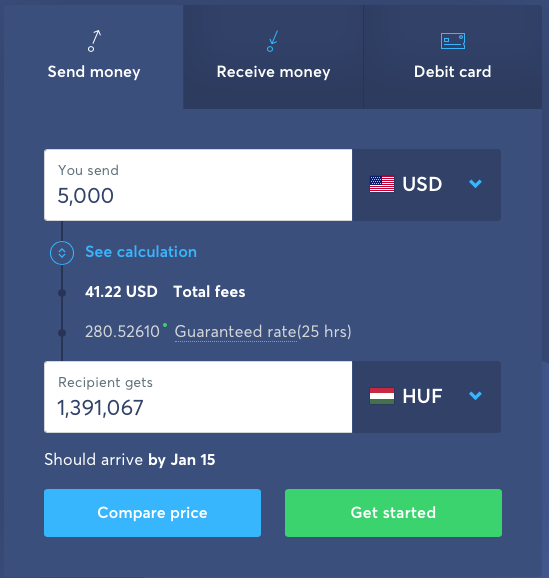 As an early adopter I have paid no monthly fee for the card (which I have used to withdraw Euro’s in all of the Eurozone) as well as local currency in Hungary, Sweden, Czech Republic and Croatia. www.denizen.io is their website, and they are on both the Apple and Google stores, respectively. I am talking about transfers to a local bank account, there aren’t any other options with TW. I wonder where you are getting your rates? 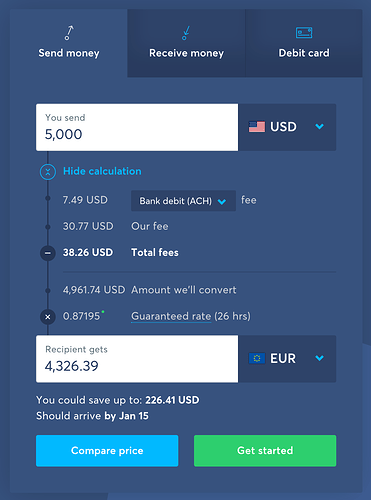 It’s currently $25 cheaper to do the transfer you mention with TransferWise than Xoom. $32.50 if your US bank doesn’t charge for wire transfers so you get out of the ACH fee with TW. TranswerWise is also twice as fast as Xoom (next day vs two days). I tried to sign up, but unfortunately wasn’t able to since I’m not a permanent resident in either of those countries. On paper it sounds like a great product, so it’s great to hear that have been your experience as well. It will be interesting to see what their plans will look like in the future, as I doubt the current pricing will be sustainable. But still, it might be worth getting an account now, in case you get grandfathered in to the current price. If I recall correctly, they hinted at something like that, no? I really didn’t have the intention to start a war - eg Mac vs Windows. For my experience, I get better rates with Xoom for bank to bank transfer. A saving of about $45.84 US. My bad, I saw EU in your first post and assumed EUR. I haven’t checked out all currency pairs, but it seems like at least for USD to HUF of that size they are indeed cheaper. But I wouldn’t extrapolate from USD -> HUF and conclude that they are cheaper for all/most transfers to the EU (who after all tend to be EUR or GBP, where TW has the edge). Bottom line, it’s worth checking with both providers before any given transfer. Hello, thank you, very useful article. I have an account on Oceanpay, (don’t know if you heard of it) it’s supposed to be an international account. The fees to withdraw from the atm on different countries are high, and sometimes even to use it at some places to pay. Would you recommend to get an account in N26, I’m scared since I don’t really live in Europe, the account in oceanpay is in usd, N26 account only take euros? So would it be more expensive because of the exchange rate? I agree I’ve been using N26 for a year now and I really like the app. Even if I have been overcharged when making payments or sometimes double payments N26 always refunds me and charge me correctly. Honestly I use it as my main Mastercard and I use it a lot abroad. It cannot beat other banks with transaction cost and currency exchange. I also got Mastercard from Transferwise which basically the same and also have a Neat card which from Hong Kong well at first it seems N26 and NEAT are exactly the same but clearly there is something wrong with NEAT and they are not so trustable as N26 which has been approved by the Germany Banking association. Thanks for the full article, it had widened my views. I’m italian and I currently live in Japan I decided to go back to the Old Continent (Europe probably -but I’m checking Brexit news- or ) within the year or in January 2020 at the latest. I was looking at N26 infos and I was excited by it, since it could be the solution for my money to be somewhere in my period of transition between countries, but since I lived here for 5 years I no longer have a residence address in Italy. My parents live there, but legally I don’t live with them anymore so I’m not sure I can use their address. I mean I could use it for the card to be shipped there, but I’m not sure I can use it as the user residence address. And it looks like I need an address within Europe where I result to be living…? If you’re not living in an EU or EEA country, you are technically not able to sign up for N26. However, if you sign up using your parents address to receive the card, there shouldn’t be any issues. Your parents address will be sufficient for them to verify your residency in the EU or EEA. Perhaps in the future they will start asking for more detailed address proof (e.g. utility bill with your name), however right now it’s fairly easy. Perhaps they’re turning a blind eye to this workaround to grow more users, who knows. Afterwards, you should be able to use the N26 account without any issues in Europe and abroad. I haven’t heard of anyone having their account closed for being a non-resident of Europe. Majority of the accounts closures I’ve read about online have been related to some kind of suspicious activity (e.g. cryptocurrencies, money laundering). So if you use the account for normal spending and don’t do large suspicious transfers and transactions, it should work fine. 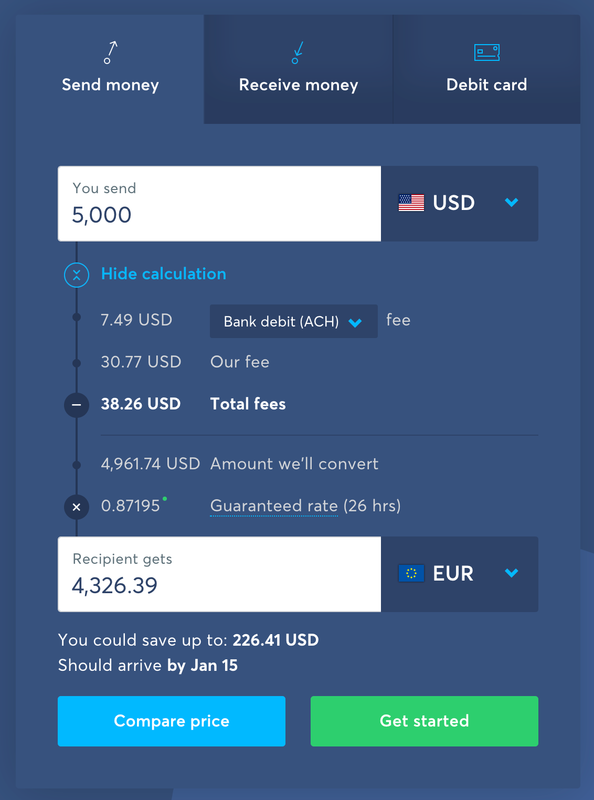 I would also suggest signing up for Transferwise if you get the chance since they offer a handy debit card for EU/EEA residents. Transferwise is also easy to sign up for and the card delivery to your parents address is sufficient for address verification. However, if you already have a Transferwise account and wish to change your address, they will require detailed address proof. If you’re not living in an EU or EEA country, you are technically not able to sign up for N26. However, if you sign up using your parents address to receive the card, there shouldn’t be any issues. Your parents address will be sufficient for them to verify your residency in the EU or EEA. This is exactly right. You shouldn’t have any problems signing up with your parents’ address, and then updating it to your British or Irish address once you get settled there. Note that you’ll get a EUR account in Italy, but if you end up moving to the UK you can just open a Monzo or Starling account there, or close your EUR denominated N26 account and then re-open it a couple weeks later as a GBP account. I found an issue in therm of transparency related to the insurance product N26 proposes. That is, they excite you by telling you are covered for this and that and that everywhere you go in the world, all included in your N26 plan. While in fact, if you look in the details of the insurance company, you are just covered for two ways trips that originate just and only from/back to your city of residency. Being N26 a Card/account thought with flexibility, especially for recurring travellers and nomads it is a good product in some regards, but don’t rely on their insurance for it is close to useless for our lifestyle.